The organisers of RAF Cosford Air Show today announced that all tickets available through their online and phone line sales operations are sold out. Air Show Chairman Wing Commander Kevin Rayner said “We are delighted with the take up this year, particularly as this is the first year we have run an advance ticket only event”. Tickets are still available from the show’s retail outlets throughout the region, details of which are on their web site http://www.cosfordairshow.co.uk. . The joint air show and rail travel tickets are also still available through manned rail ticket offices across the country, but both are selling fast. Wing Commander Rayner added “We are on track for a complete sell out in the next few days. It is important that people understand they must not travel to the show without a ticket. This is the first time that there will be no tickets available on the gate”. Organisers are hoping for even more improvements to last year’s successful traffic plan. Air Show Director Clive Elliott said “The new car park outside Gate 1 will offer a really speedy entry and exit, and the fact that our gate teams won’t be spending time selling tickets means traffic should flow better than even before”. The Royal Air Force Museum is proud to announce its official association with the Pembroke Dock Sunderland Trust. Today a Memorandum of Understanding (MOU) was formally signed between the Royal Air Force Museum and the Pembroke Dock Sunderland Trust (PDST) in the presence of the Museum’s CEO Maggie Appleton MBE and PDST Chairman, William McNamara, OBE. The MOU will see the RAF Museum and Pembroke Dock Sunderland Trust establish a partnership to foster the interests of both parties through collaborative programmes and events. It will also offer professional development for staff, apprentices and volunteers and develop opportunities for complementary fundraising. The organisers of the RAF Cosford Air Show have announced details of the Science, Technology, Engineering and Maths Hangar which, for the first time, has been generously supported by the RAF Charitable Trust. The STEM Hangar has been one of a number of popular ground displays with its interactive and engaging exhibits. With a number of exciting additions this year, including a stage, this year’s STEM Hangar is set to be a must-see attraction. Featured on the stage will be various local organisations including Mad Science West Midlands, who will be performing mind-blowing experiments, and the University of Wolverhampton, showcasing the higher education establishment’s efforts to promote the STEM fields. Other high profile companies that will be attending for the first time include BAE Systems and Raytheon, both of which are bringing dedicated vehicles demonstrating the vast array of careers that are involved in Science, Technology, Engineering and Maths. The RAF Cosford Air Show STEM Hangar, supported by RAFCT,is pleased to be welcoming back old favourites such as the AMRC Mantra Truck and Enginuity, one of the Ironbridge Museums, which have always been popular exhibits. These exhibits, along with those from RAF Cosford, the home of RAF Engineering, mean that every aspect of technology and aeronautics is on display. With over 80% of tickets for the air show now sold, organisers are urging those who wish to attend to purchase their tickets as soon as possible to avoid disappointment. For the first time this year, tickets to the air show will not be available on the gate. Organisers of the Royal International Air Tattoo believe the last ever appearance at RAF Fairford of the world’s only airworthy Vulcan bomber plus a Battle of Britain massed flypast have led to unprecedented ticket sales for the July 17-19 event.Tickets for all the enclosures have sold out for Saturday, July 18 with only a few remaining in the Viewing Village Garden. Airshow admission tickets for the Saturday are expected to sell-out within a fortnight. Air Tattoo spokesman Richard Arquati said a number of factors had contributed towards the current surge in ticket sales. He said: “After last summer’s 140,000 sell-out, people don’t want to miss out this year. By securing Earlybird tickets by the May 31 deadline, they’ll not only be guaranteed a great day out, but they will be making a saving of £5 off the cost of a standard advance ticket. In addition to an eight-hour flying display, visitors will be able to view a wide range of aircraft in the Showground and enjoy a feast of fun-packed interactive activities for the whole family including the Techno Zone, Adrenalin Zone, Vintage Village and, new for 2015 – the Autodrome. The Air Tattoo is staged annually in support of the RAF Charitable Trust. Tickets for the event are only available in advance. 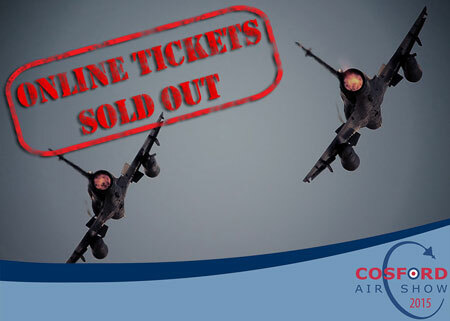 Specially-priced Earlybird tickets are available until May 31 from www.airtattoo.com or by calling 0800 107 1940. All accompanied under-16s go free. Free parking. The Royal Air Force Museum has been advised today that its London site has been admitted into Tripadvisor’s Hall of Fame. This accolade has been granted for excellence in Customer Service and recognises that the Museum’s London site is now a five time winner of a Certificate of Excellence from Tripadvisor – being granted one every year since 2011. To win a Certificate of Excellence a venue must score an approval rating of 80% or more from visitors who comment about it on Tripadvisor during the course of a given calendar year. Only 10% of all venues listed on the website receive this accolade. Therefore, to receive such a response for 5 years running is a major testament to the high quality experience that visitors receive at the Museum. ‘ I would like to thank Tripadvisor for admitting the Royal Air Force Museum London into its Hall of Fame. This honour is indicative of the commitment that staff have made to excellent customer service at the Museum and reflects the commitment that the Museum has itself made to ensuring that its collections are as accessible as possible. Over the last 12 months, we have won an Autism Access award from Autism U.K, created a Quiet Room and produced downloadable guides for those of our visitors with autism. We have also become members of the Blue Assist programme, to cater for those of our visitors who have learning disabilities. For those who acquire additional assistance with their access, we provide complimentary wheel-chairs on request. Admission to the Royal Air Force Museum at London is free of charge. The Museum is open daily from 10:00 am. For further information about the events and exhibitions at the Museum’s London site please go to www.rafmuseum.org/whatson. IWM Duxford takes great care to ensure its air shows are as safe as possible for everyone involved. · It is not safe to occupy the fields immediately south of the runway during the air show. If you do so you are putting yourself and the display pilots in harm’s way. · In the event of an incident it is imperative that the emergency services have clear, unhindered access to the tracks across this land. · There is no public access to these fields at any time. Jointly issued by IWM Duxford, Cambridgeshire Constabulary and the owners of this land. With less than a month to go before the RAF Cosford Air Show, organisers have confirmed the appearance of more exciting aircraft which will be jetting in on Sunday 14th June. 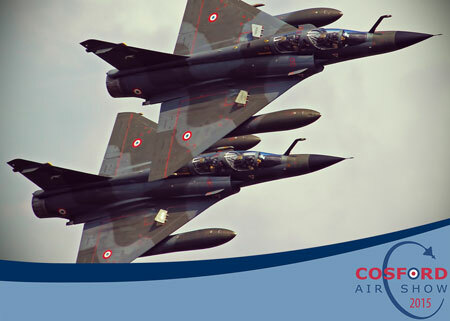 Adding to the international flavour of this year’s flying display will be an exciting display from ‘Ramex Delta’ featuring a pair of Mirage 2000N jet fighters. One of the French Air Force’s official display teams, the tactical display showcases the capabilities of the Mirage 2000N aircraft and the techniques used by the French Air Force when operating in challenging combat environments. Another two additions to the flying display announced today alongside Ramex Delta include a rare flypast from a RAF Voyager KC3 tanker aircraft and a performance from Ian Gallacher flying the RAFSGA Schleicher ASK-21 Glider. Other rare and exciting aircraft which will be appearing at the show include a flying display from a Boeing B727 airliner, a rare flypast from a German Navy P-3C Orion and an explosive display from a pair of Apache helicopters. More than 60% of the tickets for this year’s show have already been sold, with show organisers urging people to buy their tickets now to avoid disappointment. They are again reminding people that tickets will not be available to purchase on the gate for the first time this year. With adult tickets only £22.00 and accompanied under-16s entering for free, it is a great value for money event with entertainment for all the family. This summer will see one of the most iconic aircraft of the past 60 years make its last ever Royal International Air Tattoo appearance. Itfollows an announcement by the Vulcan to the Sky Trust (VTTS)that 2015 would be the legendary Cold War bomber’s final display season. The delta-winged Vulcan XH558is the only flying example in the world having been restored to flying condition in 2007 following a public fundraising campaignthat helped raise more than £7 million. 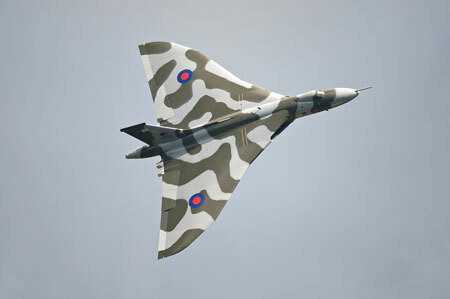 Since then its thunderous yet graceful display has been one of the most eagerly-anticipated on the UK airshow circuit. However, VTTS has announced that a number of factors, including the withdrawal of technical support, had contributed to its decision to ground the aircraft for the final time after the 2015 airshow season. VTTS is now determined to see XH558 end its flying days with a flourish and has earmarked the world’s largest military airshow as the place to give the aircraft a special send-off. The Air Tattoo is staged annually in support of the RAF Charitable Trust. Tickets for the event on July 17-19 are only available in advance. 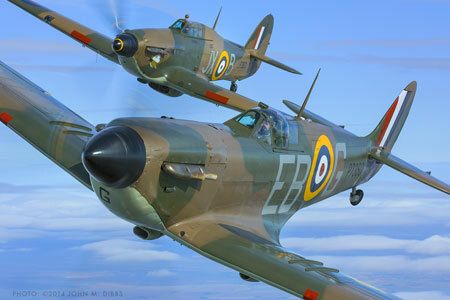 Special Earlybird tickets priced from £31 are available until May 31 from www.airtattoo.com or by calling 0800 107 1940. All accompanied under-16s go free. Free parking. After careful consideration by its Collections Review and Disposals Recipient Selection Committees, the RAF Museum is pleased to announce the transfer of Saro Skeeter AOP.12 XM555 to North East Land Sea and Air Museum (NELSAM). The Skeeter is a two-seat training and scout helicopter which was produced by Saunders-Roe (“Saro”) of Cowes and Southampton. It has the distinction of being the first helicopter to be used by the British Army Air Corps (AAC) and several Skeeter AOP.12s were operated by the Central Flying School of the Royal Air Force. This particular example was ordered in 1957 and its service history was primarily with the AAC. After being declared non-effective in the late 1960’s it was allocated to various RAF stations across the country for training or display purposes before finding a home in the early 1980’s at the Aerospace Museum RAF Cosford – now RAF Museum Cosford. 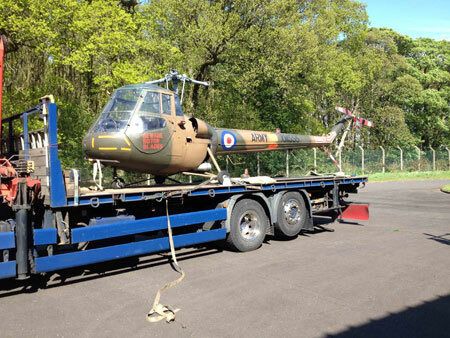 In 2003 it was transported to the Museum’s London site for display before entering storage in 2010 (for full aircraft history see below). The Royal Air Force Museum Cosford’s iconic cold-war prototype jet, the TSR2 will be joining the static aircraft displays at the RAF Cosford Air Show on Sunday 14 June 2015. The TSR2 was an ambitious British built aircraft, designed to be used as a tactical strike and reconnaissance aircraft for the Royal Air Force during the Cold War. Although the aircraft never made it past prototype stage, the British Aircraft Corporation TSR2 was one of the most exciting and controversial British combat aircraft designs of the 1960s. The cancellation of the project is a subject of great debate to this day. During the mid-1950s, the increasing sophistication of air defence systems led the RAF to consider the procurement of a high speed, low level strike and reconnaissance aircraft to replace the English Electric Canberra. In October 1957, the Ministry of Supply released the first specification for such an aircraft and by January 1959, they announced a design had been selected for production. Christened the TSR2 (Tactical Strike and Reconnaissance Mach 2), this aircraft was developed by a joint design team. A contract for eleven TSR2 prototypes was concluded in October 1960, the first (XR219) made its maiden flight from Boscombe Down in September 1964. By March 1965 XR219 had completed twenty-four flights, and a second, the aircraft on display at Cosford, was to join the programme. Initial reports indicated that the TSR2 was an outstanding technical success. However political opposition to the project led to it being cancelled from 6 April 1965. The aircraft will be moved outside and onto the airfield a few days prior to the Air Show. 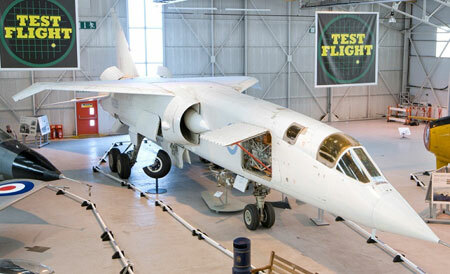 Following the event, the TSR2 will go back on display in the Museum’s Test Flight hangar. For the first time, tickets for the RAF Cosford Air Show 2015 are advance sale only. Adult tickets are priced £22.00 with accompanied under 16s free. For more details on the event or to purchase tickets please visit www.cosfordairshow.co.uk or call the 24 hour ticket line on 0871 230 1083. STAAR recruits are ready for take-off!